Best For: USAA members who know they’ll spend enough to earn the full 5% and 2% cash back rewards. Not all USAA members live on a military base. For those who do, though, the USAA® Cashback Rewards Plus Express® Card offers compelling rewards. The first $3,000 you spend in a given year on gas and military base purchases combined will earn 5% cash back. Your first $3,000 spent in supermarket grocery purchases will earn you 2% cash back. All other purchases earn 1% cash back, with no cap on your earnings. There’s no annual fee required to get access to the benefits of the USAA® Cashback Rewards Plus Express® Card, and you won’t pay a foreign transaction fee when you use the card abroad. As with other USAA rewards cards, the USAA® Cashback Rewards Plus Express® Card has easy-to-redeem rewards. You can redeem your cash rewards at any time, on your desktop or your mobile phone. 5% cash back on gas and military base purchases – The USAA Cashback Rewards Plus American Express® Card offers top-of-the-line cash back rates on gas and on-base purchases. Earn 5% cash back on purchases at gas stations, commissaries, exchange and shopette locations on base up to your first $3,000 in annual purchases for these categories combined. Once you hit that limit you’ll continue to earn 1% cash back. Smart Tip: If you’re determined to get the most out of your USAA® Cashback Rewards Plus Express® Card, it’s a good idea to keep track of your spending on gas, on-base purchases and groceries. 2% cash back on supermarket purchases – The USAA Cashback Rewards Plus American Express® Card offers a solid 2% cash back on grocery purchases at the supermarket, up to your first $3,000 spent in a year. Once you hit that limit you’ll continue to earn 1% cash back on your groceries. No foreign transaction fee – Leaving the country? Not to worry. The USAA® Cashback Rewards Plus Express® Card doesn’t charge a foreign transaction fee. No annual fee – You might expect that a card with generous rewards would charge an annual fee. Well, the USAA® Cashback Rewards Plus Express® Card doesn’t have an annual fee. You don’t have to pay for the chance to earn serious cash back. No penalty APR – With some cards, missing a payment automatically bumps up your APR to a penalty APR that can take as long as six months to get out of. But with the USAA® Cashback Rewards Plus Express® Card you don’t have to worry about a single mistake leading to a spike in your APR. 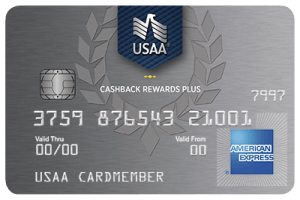 Special military benefits – Like other USAA cards, the USAA® Cashback Rewards Plus Express® Card comes with special benefits to its military cardholders. In case of deployment or Permanent Change of Station (PCS), your APR on your balance goes down to just 4% for 12 months. The same offer stands if you enter active duty, as a condition of the Servicemembers Civil Relief Act. The primary beneficiaries of the terms of the USAA® Cashback Rewards Plus Express® Card will be those who can spend $3,000 per year in gas or on-base purchases and $3,000 per year on groceries. Not sure if you can hit these targets? If you don’t already have a budget, try tracking your spending for a month and then extrapolating from there. If you don’t spend much on gas, groceries or purchases in on-base establishments like shops and commissaries, you’ll still get 1% cash back on your other purchases with the USAA® Cashback Rewards Plus Express® Card. However, you could do better than that 1%. For example, USAA offers a flat-rate cash back card that pays 1.5% on all purchases. With the USAA® Cashback Rewards Plus Express® Card you earn cash back as you swipe. You can claim your cash rewards (in $1.00 increments) at any time via the mobile app or through your USAA account on your desktop computer. Even after you max out the $3,000 limit to get 5% cash back on gas and on-base purchases and the $3,000 limit to get 2% cash back on groceries, you’ll still earn 1% cash back in those purchase categories. The APR on the USAA® Cashback Rewards Plus Express® Card ranges from 14.15% - 28.15% Variable. That’s in line with many other USAA cards, but it’s a pretty high rate if you know you’re going to be carrying revolving debt on the card. The USAA® Cashback Rewards Plus Express® Card is also not the ideal card for a balance transfer. Why? For one thing, you’ll pay a balance transfer fee of 3% of each transferred balance, up to a maximum of $200 per balance. But the main reason the card is not ideal for balance transfers is that there is no special balance transfer APR. Unlike some cards, which offer a 0% APR on transferred balances, the USAA® Cashback Rewards Plus Express® Card charges your regular APR on any transferred balances. The USAA® Cashback Rewards Plus Express® Cardoffers up to 5% cash back on gas and on-base purchases combined, which means you can earn up to $150 before your rewards in those categories drop down to 1% cash back. You’ll earn 2% cash back on the first $3,000 you spend on groceries, earning $30 in cash back before your rewards on groceries drop down to 1%. In all other categories you’ll earn a flat 1% cash back, with no limits on the amount you can earn. If you transfer a balance to the USAA® Cashback Rewards Plus Express® Card you will pay a 3% balance transfer fee, up to a maximum of $200 per balance. The same goes for cash advances. Your APR on transferred balances will be the same as your regular APR on the card. 14.15% - 28.15% Variable depending on your credit score. This APR is variable, so it can fluctuate according to movement in the Prime Rate. Your APR on any transferred balances will be the same as your regular APR – 14.15% - 28.15% Variable, depending on your credit score. The APR range for cash advances is the same as the regular APR range 14.15% - 28.15% Variable and also varies based on the Prime Rate. Your APR will depend on your credit score. There is no penalty APR with the USAA® Cashback Rewards Plus Express® Card. However, there is a late payment fee of $25 for your first time paying late within six billing periods. Otherwise, the late payment fee is $35. Balance Transfer 3% of the amount of each transfer, up to a maximum of $200 per balance. Cash Advance 3% of each cash advance, up to a maximum fee of $200 for each convenience check. The fee is waived when you’re transferring funds electronically to a USAA deposit account. Compared to other USAA cards, the USAA® Cashback Rewards Plus Express® Card offers the highest percentage of cash back. However, to get the 5% or 2% cash back deal you’ll have to spend on gas, on-base purchases and groceries. If you tend not to spend much in those categories, you may prefer a card with a flat 1.5% cash back across all categories – a card like the USAA Preferred Cash Rewards Visa® Signature card. If you have balances from other credit cards that you’d like to knock out, you’d be well served by a card with a 0% APR on balance transfers, which the USAA® Cashback Rewards Plus Express® Card doesn’t offer. For USAA members who live on base and spend plenty of money on base, at the gas station and in grocery stores, the USAA® Cashback Rewards Plus Express® Card offers generous cash rewards, plus consumer protections for servicemembers that USAA members expect from the bank’s cards. And with no annual fee, foreign transaction fee or penalty APR there’s not much downside risk to the card, unless you have balances you’re looking to transfer.